1. Melt bars of white chocolate in a double boiler. 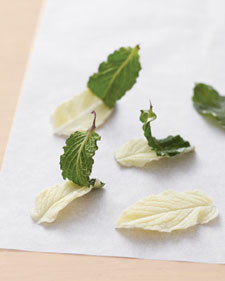 Use a small paintbrush to apply chocolate to the undersides of heavily textured mint leaves. (Some cakes require about 100 leaves, but it's a good idea to make extras.) Drape the coated leaves over the rounded heads of plastic spoons to create a curved shape (clip off the handles to save space); chill for two hours or overnight. 2. Gently pull the leaves away; store in the refrigerator. On the big day, attach them one by one to the cake with piped royal icing.